pMTJ STT-MRAM developer Avalanche Technology announced its 2nd-generation serial non-volatile discrete MRAM memory family. The SPnvSRAM family offers 1 Mb to 32 Mb densities at extended-temperature industrial-grade specifications. 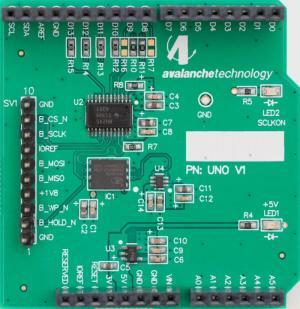 Avalanche says that these devices, available in low pin count, small package options, are ideal for a broad range of industrial, automotive and consumer applications. Avalanche's 2-Gen SPnvSRAM is offered in 108-MHz Quad Serial Peripheral Interface (QSPI) performance as a byte addressable memory thus eliminating the need for software device drivers. In August 2018, Avalanche Technologies announced that it has entered into a joint development and production agreement with Taiwan's United Microelectronics Corporation (UMC) - under which UMC will provide embedded non-volatile STT-MRAM blocks based on UMC's 28nm CMOS manufacturing process. In February 2016 Avalanche Technology raised $23 million and announced it has a substantial debt facility in place with Horizon Technology Finance. In 2016 the company also entered into a manufacturing agreement with Sony Semiconductor Manufacturing Corporation (SSMC) for volume production of its STT-MRAM on 300 mm wafers, which started in 2017.